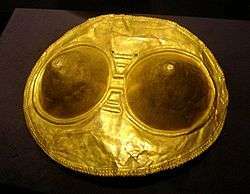 A pectoral of tumbaga, of the Quimbaya culture; 300–1600 AD. Tumbaga was the name given by Spaniards to a non-specific alloy of gold and copper which they found in widespread use in pre-Columbian Mesoamerica and South America. Tumbaga was widely used by the pre-Columbian cultures of Central America to make religious objects. Like most gold alloys, tumbaga was versatile and could be cast, drawn, hammered, gilded, soldered, welded, plated, hardened, annealed, polished, engraved, embossed, and inlaid. The proportion of gold to copper in artifacts varies widely; items have been found with as much as 97% gold while others instead contain 97% copper. Some tumbaga has also been found to be composed of metals besides gold and copper, up to 18% of the total mass of the tumbaga. Tumbaga objects were often made using the lost wax technique and the alloy used was a mixture of copper (80%), silver (15%), and gold (5%). The indicated concentrations varied from object to object. Once the object was taken out of the cast, it was burned and as a consequence, copper from the surface of the object was oxidized to copper oxide and was then removed mechanically. The object was then placed in an oxidizing solution containing, it is believed, sodium chloride (salt), and ferric sulfate. This process removed through oxidation the silver from the surface of the object leaving only gold. When looking through a microscope, one may clearly see the empty spots from where the original elements copper and silver were removed. In 1992, approximately 200 silver "tumbaga" bars were recovered in wreckage off Grand Bahama Island. They were composed of mainly silver, copper, and gold plundered by the Spaniards during the conquests of Cortés and hastily melted into bars of tumbaga for transport across the Atlantic. Because all the metals that reached Europe were melted back into their constituent metals in Spain, the bars found in the shipwreck are the only known bars of this type that remain. Tumbaga was suggested as a way to increase capacity on Li-ion batteries, in the form of a laser nanoetched alloy. This has the side effect of confining copper (needed for active material binding) to small islands and thus limiting dendrite formation. The cells made using this technology unlike most Li-ion can be discharged below 2V safely and even down to 0V however need an extensive reconditioning process to get full capacity again based on induction via central field coils (this was discovered in 2013) An additional modification suggested by the classified US patent was to use a liquid electrolyte based on viologens (similar to electrochromics) as this although somewhat unstable in this application optimized long term storage at zero C 39% SOC and extended cycle life to 1000+ charges.